Maybe you’ve been standing in line since 4:30 a.m. and you’ve returned home with the flu and bags and bags of merchandise that you purchased because you wanted a good deal. You’re hungry, tired, and thirsty. So, it's time to grab a beer and dig into those leftovers. Or maybe you've been lounging at home all morning (our favorite Black Friday activity) but you're really not too keen on preparing T-Day 2.0 as another round for dinner. We understand completely — we love the big T-Day supper, but when it comes to the day after, we want leftovers that are more creative, instead of being a rerun. 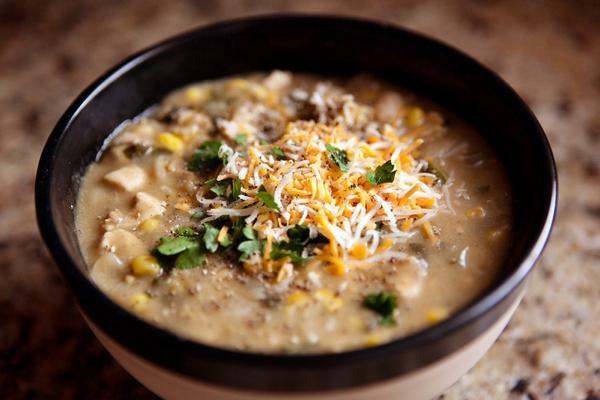 This chili does the trick. Make it first thing in the morning so it sits all day, awaiting your hungry return from the mall or the couch. If using the canned chipotle chilies, in a blender purée them with the water and reserve the purée. Drain the canned tomatillos and in puree in a blender. Reserve the purée. In a large heavy kettle, cook the onions and 6 of the garlic cloves, minced, in the oil over moderate heat, stirring, until the onions are softened, add the cumin, and cook the mixture, stirring, for 30 seconds. Add the ground turkey and cook the mixture, stirring and breaking up the lumps, until the turkey is no longer pink. Add the cooked shredded turkey, the reserved chipotle purée, the reserved tomatillo purée, the broth, the bay leaf, the oregano, and the salt and simmer the mixture, uncovered, adding more water if necessary to keep the turkey barely covered, for one hour. Stir in the bell pepper, the canned green chilies, and the cornmeal and simmer the mixture, stirring occasionally, for 30 minutes. Stir in the white beans, the corn, the remaining two garlic cloves, minced, and salt to taste, simmer the chili for three to five minutes, or until the beans are heated through, and discard the bay leaf. Serve the chili with your choice of add ins. Here’s a good spot for that second cervesa! 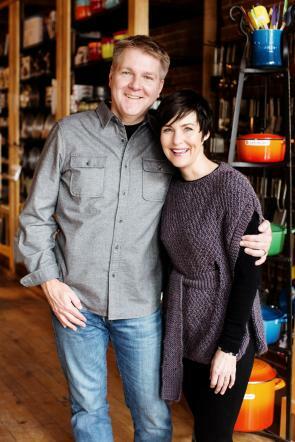 For more than 15 years, Karl Benson and Marie Dwyer have been the creative leaders behind Cooks of Crocus Hill — a Twin Cities independent specialty culinary retailer and educator focused on sharing the belief that "Life Happens in the Kitchen." They are also the publishers of Simple, Good & Tasty.